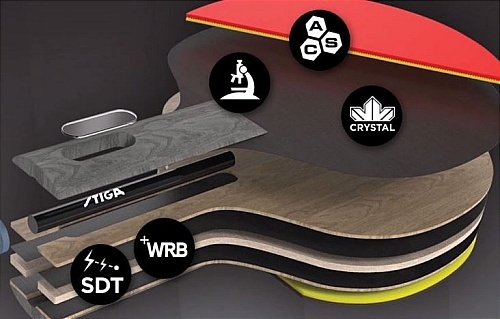 STIGA has been released a series of premade table tennis paddles on the market that receive a very warm welcome. The STIGA Evolution is among the rock-solid pre-assembled racket which can offers players with great quality and it is especially ideal for players in the intermediate level. Stiga is a reputable sport equipment company that always produced great table tennis equipment including the rackets. Sometimes some of the rackets that the company sell is not cheap. But you can rest assured of the quality. For this racket, it is a quality one and you will not be going to waste your money if you get one. What’s Good About Stiga Evolution? The STIGA Evolution comes with premium rubbers that are having a thickness of 2.0mm. The paddle is constructed from a 6-ply light blade. The blade is built with a Shock Dispersion Tube. This technology produces the handle to be a hollow part which plays a vital role in transferring the shockwaves generated when the ball hits the racket and spread them out evenly across the entire bat. Shock Dispersion Technology (SDT) is an innovative technology that can effectively absorb vibrations and transfers energy out of the handle. Thus, it helps in improved speed, feels, and control. Evolution is the most wanted pre-assembled paddle compare to others due to it’s lightweight to hold in any player’s hand and it is very nimble. It only weighs 170 grams. Besides, it is well-balanced with great quality rubber that is produced with nanocomposite technology. This makes the rubber can affix to the blade tighter and therefore offering better speed and spin. Those who been playing ping pong for quite some time and already possess some playing skills but would wish to progress to intermediate level may found this performance-level racket can provide them with good help. There is no problem for you to use this racket for any competition since it’s ITTF approved. This racket is not a racket that is suitable for offensive players who play aggressively in the game. You can get good control with this racket but at the same time, you are going to lose the speed. It is especially not suitable for players who love to play far away from the table. They are going to exert a lot of strength and sometime they will still found the ball is not able to shot well over the net. You can have a really good feel by gripping the racket in your hand. It can help to improve your play incredibly. The blade is constructed with a flared handle, so you can hold whatever the way you want it to be. If you like a racket that has longer handlebar for a very comfortable grip, then this one will fit you well. The handle of the racket is a bit short but you won’t feel any uncomfortable when you hold the handle of the racket in your hand. The rubber may not be able to offer a great spin as you expect it to be. The power may not strong enough for some players. Speed also not as fast as some players may expect it to be. Many players are using this STIGA Evolution racket on a regular basis during their table tennis practice. Even it is a little slower but they found it is great to practice with this racket because it offers great control. It can absolutely improve your playing style. If you first use the racket, you make need to takes some times to get used to the Shock Dispersion Tube in the handle. But after a certain period of time playing with it, you will find this racket can give you great spin and easy control. It is recommended for beginner players who are looking for a good rock solid blade that can provide them with good control. This racket is ideal for seasonal players who are having trouble keeping volatile and want to go back to the basics. You may get a mediocre racket to play table tennis when you start to play this sport. After some time, you may want to think of upgrade your racket to be a better one. The Stiga Evolution is a great pre-made racket that you can consider to buy when you are looking for improving your playing skill from the recreation level to the next level. This is a great defensive racket for you to have. You can play with decent spin and good control by using this racket. However, after playing for some times, the rubber may start not to perform too well, it can slow down your shot quite a bit. By that time, you will need to think of changing the rubber. The good thing for this racket is the rubber can be easily removed and replace with a new one. It is lighter than most of the rackets that are of similar range like the DHS A4002. The DHS A4002 is heavier than the Stiga Evolution and the former speed is slower than the later. By having this racket with the price you pay for it, it can really exceed your expectations. You will expect most of the rackets are made from China. But made from China doesn’t mean they are counterfeit rackets. As long as you are buying from reliable and trustworthy resellers or online store. One of the most trustworthy online shopping sites would be Amazon. If you are looking to buy this racket, you can buy from Amazon. There are also various STIGA table tennis tables that you may want to have a look.